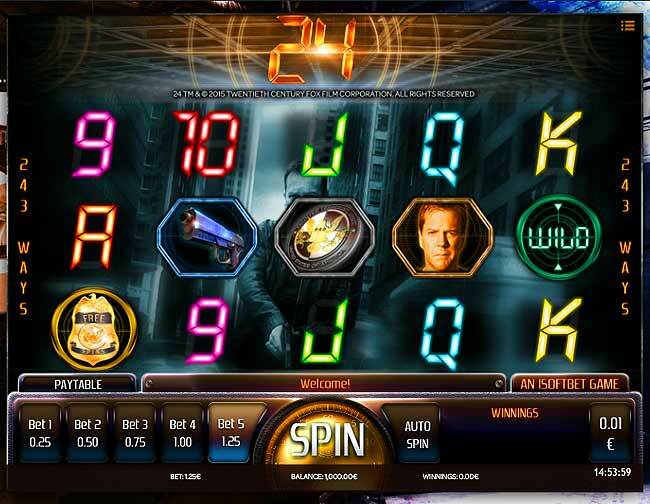 Jack Bauer is looking for a trusted and experienced assistant to fuel his habit for online slots gaming. 24 came to our screens in 2001 with its ground-breaking real-time action centred around global terrorism and other threats. Earn the respect of Jack and his team as you play through this cinematic online 5 reel that features all the familiar faces from the award-winning TV show. This game was designed and developed by IsoftBet, an online and mobile casino games supplier, providing fun and profits to some of the world’s largest and most-successful e-gaming casinos. They are famous for always being always aware of what their clients are looking for. Being certified in vast areas, including Spain, Italy, Portugal, Belgium and the UK, they are a highly skilled bunch of individuals that always match strict protocols and challenges. You can discover more about some of IsoftBet's games here. The title of this game represents nothing more than the hours/day that you’ll be spinning and winning with this online slots game from iSoftBet. That’s right, 24 Slot, is an amazing title conceived by the wise lads at iSoftBet for you to enjoy. Consisting in 5 reels, 3 rows and 10 paylines, this game puts you in the position of playing an anti-terrorist assistant for Agent Jack Bauer. Inspired by the world famous US of A TV series comprised by Joel Surnow and Robert Cochran about the Director of Field Operations within the Anti-Terrorist Unit of L.A., that discloses the plots of terrorists and annihilates them within 24 hours. When it comes to design, this game is strictly accomplished using depicted scenes and characters of the original TV show, including his gear, his scenes and even music and phrases spoken by the protagonist, agent Jack Bauer himself. Let’s jump into gameplay and first of all, notice that this title contains a couple of additional symbols and features that make it unique and exciting, in comparison to other online slots games. The scatter symbols on this game, does not depend on its position on the game reels, so you can get guaranteed prizes once you land on at least 3 of them on an active payline. A sticky wild is also featured in this game, as they can land on the 2nd, 3rd or 4th reel(s) only and as one of them shows up on the reel, it will transform 1-3 random symbols into wilds, so how cheeky is that?! Each and every of the showing Wilds stick to their spots for a bonus free re-spin, so here you have some more great news. Just to let you know, all Wild symbols replace any existing symbol, apart from the scatter. You are working within a tight timescale here, so as you complete the mission, you will get to play a bonus game. As soon as the timer above the reels frame reaches 00:00, you will get to play the bonus game that you deserve. Apart from that, shoot the bloody terrorists and get yourself whooping instant prizes or even the grand jackpot, as they are all there for you to claim!!! Saving the world is not an easy job, right? There’s no wonder that agents get the best cars, the best ladies and the best mansions, as they’ve earned it. So can you, as you help agent Jack Bauer in his heroic battle with terrorist, earning a little fortune for yourself. 24 Hours won’t be enough for you to count the amount of money you’ve just made with 24 online slots game from iSoftBet.